Think of the Drone as the Satellite’s little sister. Over the years we received many requests to develop a trimmer that provides the quality and efficiency of the Satellite while being sized and priced for the mid-sized grower. At roughly 65 percent of the capacity and cost of the Satellite, you can enjoy all the benefits of a commercial trimmer without breaking the bank. The Drone is proudly made in the USA and comes with a 1-year warranty. Like the Satellite, you insert your product through the lid on top. Directly below the grate are the cutting and fan blades. 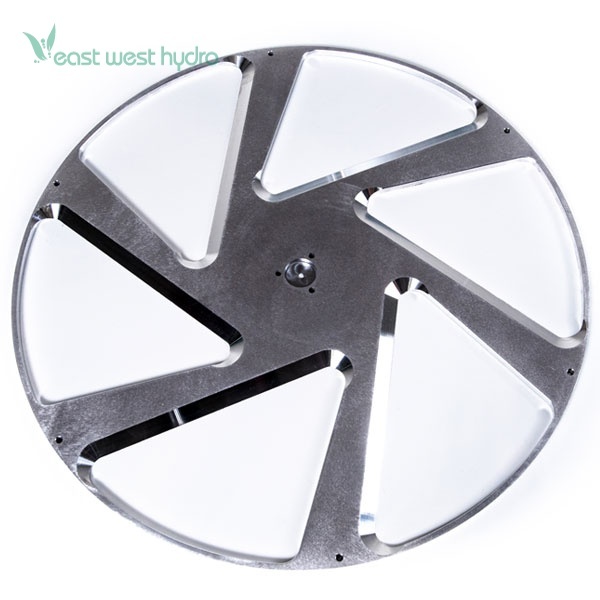 The fan blade generates both suction and an air vortex inside the drum. 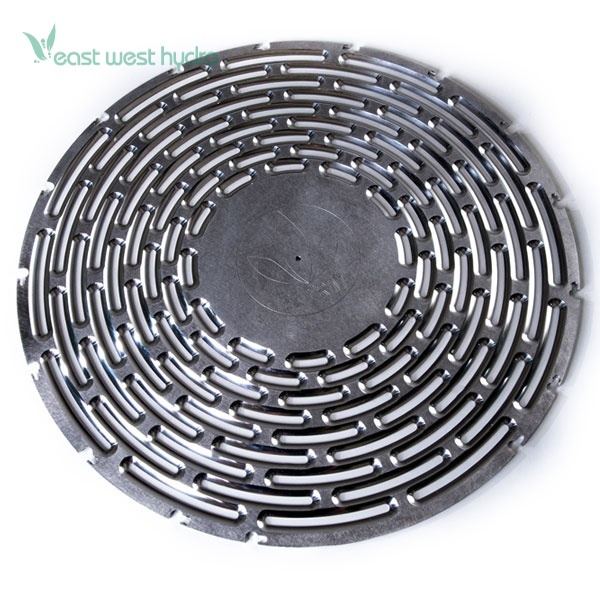 The vortex, in combination with the thin, silicon, rotor fingers gently move and roll the product over the grate without damaging your flowers. 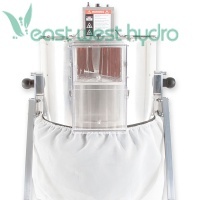 As your flowers gently roll over the beveled cutting slots in the grate, the leaves are sucked into the spinning blade below trimming and depositing the leaves into the patented triple filtration system. Once you determine your flowers are sufficiently trimmed (30 seconds to 1.5 minutes), you lift the chute gate and your product exits into the chute assembly on the front of the machine. Blade Speed / Airflow – The speed of the blade can be set to low, medium and high. As the blade speed increases so does the suction and vortex. You can further adjust the airflow by opening and closing the lids/vents on top of the machine. With the lid(s) open, there is more suction pulling the leaves through the grate. With the lids closed, there is more vortex moving the product around the drum. Based on the size, density or leafiness of the flowers and the variances between strains, you will find different blade speeds and/or lid positions are more effective in one instance over another. Blade Depth – The depth of the blade can be adjusted on-the-fly to accommodate different strains. The four knobs at the base of the motor mount can be tightened or loosened to raise or lower the blade. Be sure to keep the blade level to ensure a tight, even trim. See our video “dialing in the blade” for step-by-step instruction. Rotor/Silicon Fingers – The rotor contains 4 sets of soft, flexible, ¼ inch, food-grade silicon fingers that assist in the movement of the product over the grate. 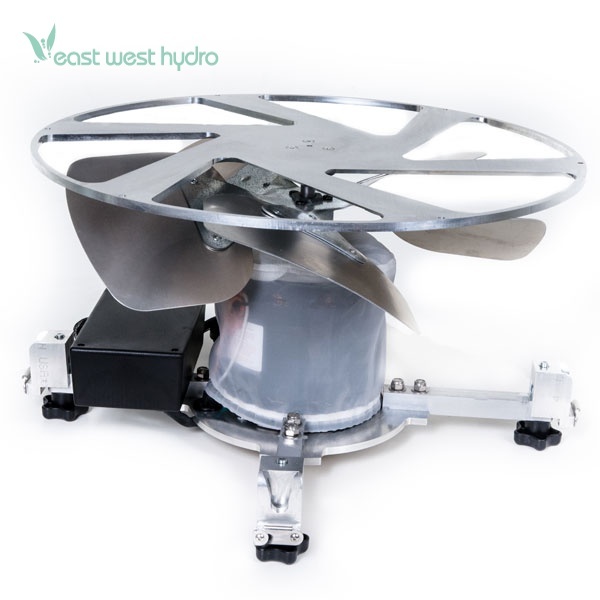 The rotor is mounted to a variable speed/reversible motor that allows you to adjust the rotor speed to match the desired airflow. Cycle Time – The patented combination of vortex and rotor technologies trims your flowers quickly delivering cycle times as low as 30 seconds. Shorter cycle times = less damage to your product. Unlike the other trimmers on the market, the Drone provides complete control over the amount of time your flowers are inside the machine. To keep your cycle times short, we recommend running smaller batches (1-2 handfuls) for around 30-45 seconds to reduce the potential for damage. This allows you to trim a greater volume in a shorter period of time. This allows you to trim longer between cleanings reducing maintenance and downtime. Filtration System – The Drone’s patented catchment and filtration system is the same as the Satellite’s. 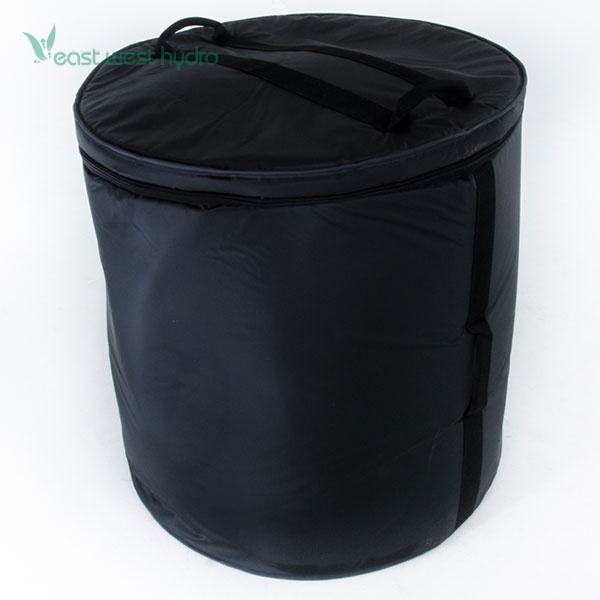 It consists of a series of bags each with a different micron count. Through the process of trimming the leaf (especially very frosty leaf) many of the trichomes become dislodged from the leaf fragments. 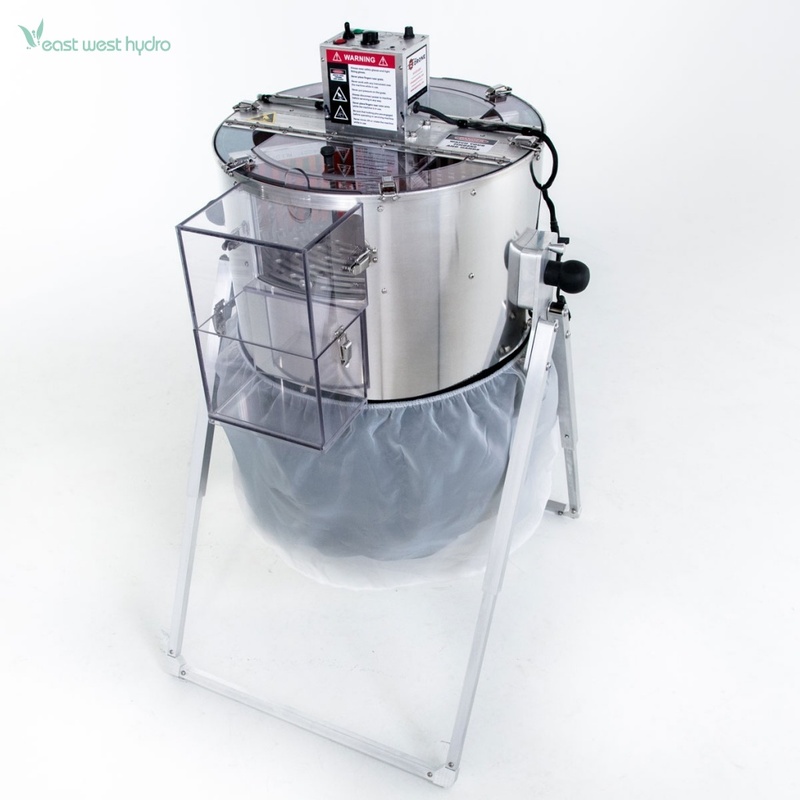 In conjunction with generating airflow and suction, the fan blade also agitates and disperses the trichomes and leaf fragments, separating the various sized particles into the filtration bags. As you trim, the innermost bag with the largest micron count captures the larger leaf fragments. The middle bag catches the smaller leaf particulate and the outer bag captures the majority of the loose trichomes (kief) dislodged from the trimmed leaf. After several hours of trimming, there is nothing but nearly pure, fine kief in the outer bag. You can then take these three grades of byproduct and further process them as you so desire. 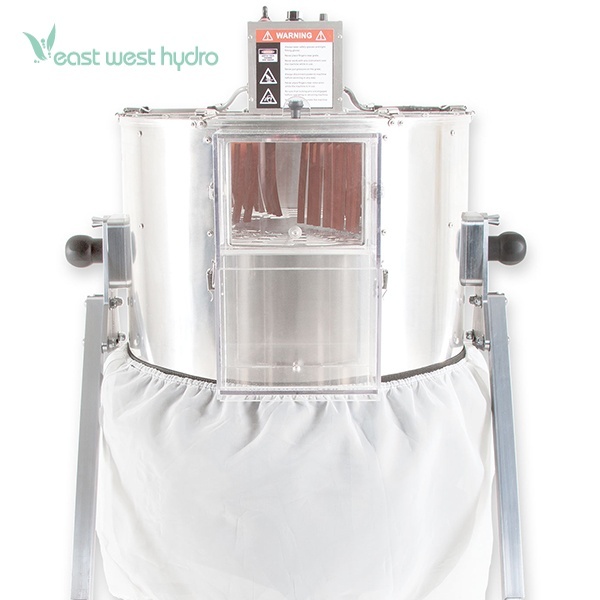 Dry Sifting – There will still be a significant amount of trichomes/kief on and amongst the trimmings in the inner and middle filtration bags. One method for harvesting the rest of this is a process called dry sifting. Once your leaf has dried for a few days (be sure to spread it out nice and thin so that it does not mold), it can be hand sifted back through the system. This is also true of the product in the outer most bag. When the trichomes are wet they will not pass through the outer bag, but when dried they can be filtered through the outer bag to produce and even finer grade of kief. Dimensions: 29in. × 29in. × 45in.